What is the PRAXIS Test? If you are studying to be a teacher, you may know that you will need to take an exam known as the PRAXIS test in order to become certified, according to the Education Testing Services. However, you may be unsure just what is involved in the testing process. The following information will help you to better understand what the test is, how it affects your future and what is expected of you so that you will be more prepared when the time comes. Commonly known as simply the Praxis, this assessment is actually a series of exams that you will need to take throughout your educational program. The PRAXIS I covers the foundation subjects of math, reading and writing. Its format is multiple choice and includes one essay question. 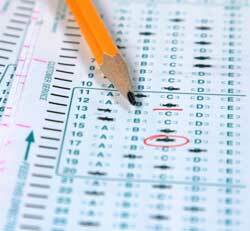 This test is usually required by students wishing to be admitted into a college’s education preparation program. Once you’ve been admitted to the program, you will begin your introductory education courses. During your time of study, you’ll need to take the PRAXIS II test. This exam is more focused than the first, more general, one. You will take a test specified for the grade level you plan to teach (elementary, middle or high school) and the subject area in which you intend to specialize (math, science, reading,etc.). During your first year of teaching, you’ll encounter the PRAXIS III, which is an observation and evaluation of your teaching methods. The PRAXIS test can either be taken on a computer or in written form. The format you are given will depend on the testing center you choose. These centers are located both in the United States and throughout other parts of the world. You can find your nearest location on the website of Education Testing Service, the company that administers the exam. You’ll need to register and pay a fee in order to secure your spot. Be sure to verify submission dates for test scores ahead of time to ensure you meet all deadlines and testing prerequisites. You will want to study and prepare for the PRAXIS. Exam preparation booklets are available through ETS, as well as through private companies,that will provide you with the kind of information to expect. You will need to meet minimum score requirements, so it’s advisable to take adequate time to study. Your score is based on how many correct answers you provide. You won’t be penalized for attempting questions you are unsure of. Remember that the point of the PRAXIS I is to ensure you possess a solid understanding of the foundations involved in math, reading and writing. In order to prove your readiness to enter an academically rigorous program and your competency to effectively teach others, you’ll need to demonstrate this level of knowledge. Performing well on this set of exams is crucial to becoming a teacher. After the PRAXIS I and you are admitted to an education program, your faculty will prepare you to do well in the remaining exams. The Praxis test is just one component in becoming a capable teacher.